The CHI1550A solution dispenser is designed for making high density and high accuracy solution arrays, which can be used in chemical, biological and sinsill applications. The solution dispenser consists of a high-resolution three-dimensional positioner, a piezoelectric jetting device, and a sample platform. The diagram is shown in Figure 1. 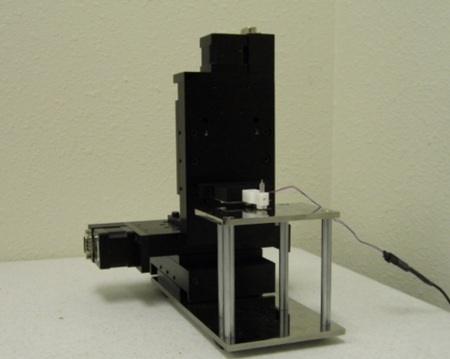 The three-dimensional positioner can travel a distance of 50 mm in all three directions with 0.1 micrometer resolution, allowing high-precision patterning. This is particularly important when multiple overlapping solution components need to be dispensed. The jetting device can dispense single drops of solutions with viscosity less than 40 centipoise and surface tension in the range of 0.02-0.07 N/m. Solutions with properties outside these limits can be jetted if changes to the properties can be achieved with solvents or changes in temperature. With a default nozzle size of 60 microns, the jetting device can produce drops ranging from 100-200 picoliters in volume, depending on the operating parameters and solution composition. The CHI1550A solution dispenser control software is very user-friendly for creating binary, ternary, and quaternary arrays of spots containing mixtures of solutions. Instead of using a manually created look-up table for solution dispensing patterns, pattern creation is facilitated by our software, which can also provide commonly used patterns as a default for binary, ternary, and quaternary arrays. The positioner can memorize certain critical positions, such as the solution loading point and first dispensing point, allowing the jetting device to go to these positions easily and quickly. The array pattern can be examined graphically, and it will also be displayed during the dispensing process.